Charles and Yuko had planned out breakfast too. While some packed up others cooked. I took over the pancake shift when the primadonna from Birmingham gave up because the mix wasn’t up to scratch. There was also a truck-load of sausages that were eagerly eaten and soon we were heading down the hill. Last night I met Takefumi, a friend of Charles’ that has ridden the length of Japan so he can sympathise with some of the stuff I am going through. Today he offered me a lift to Matsumoto but of course I couldn’t accept. I did however ask him to take my bag and thus I walked all afternoon with just a small water bottle and one hiking pole. I think I looked pretty casual considering my current undertaking. I’ve 40 marathons to complete before this game is over and 49 days to do them in. 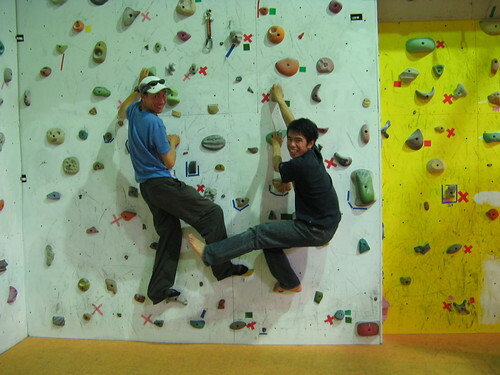 This evening Takefumi and I went his local climbing gym, Horei, where I proved how specialised my fitness is by managing only a few climbs before my fingers were too weak to hold on. I’m a member there now and until June 1st 2010 I can get in free. For dinner he cooked oyako donburi, which translates as parent-child donburi and consists of chicken and egg on rice. See the link? He says it’s an easy dish and it’s definitely one of my favourites. Tomorrow I’ll have a choice of directions. Straight north takes me through some amazing scenery. Takefumi’s photos of the area in October are stunning. Multi-coloured hillsides below jagged rocky tips of the Japanese Alps. I wish I could go through there now but bad weather may be heading this way so I’m rushing through to Nagano city and will hope to return here in Autumn. Note to other hikers. Don’t do this in the rainy season with a time limit, you’ll miss out on too much.